We left our excellent hotel bright and late but as we had only a short day to do, we were in no hurry. It was an absolutely beautiful morning. After heavy rain in the night, which soaked everything, the sun was warm and everything sparkled, with the sea completely calm. 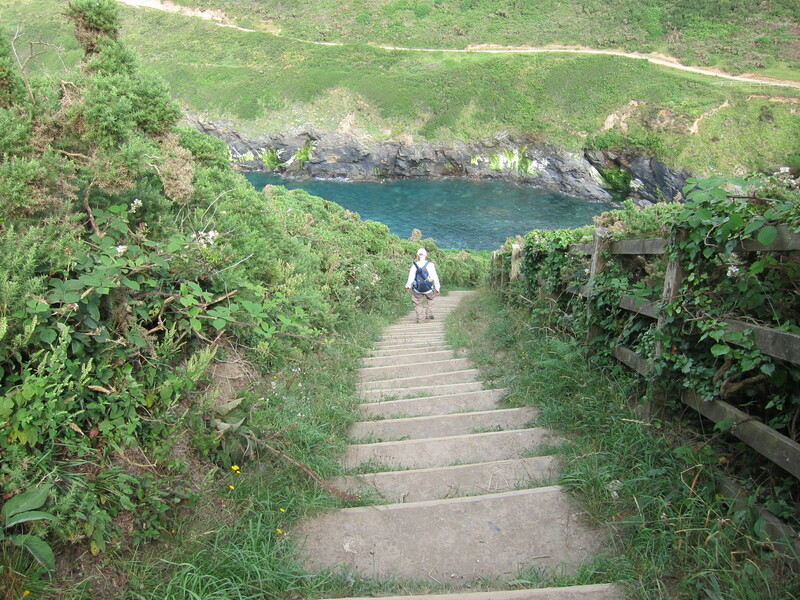 The path out of Crackington Haven is steep, sloping diagonally from behind the hotel across at a north westerly angle. 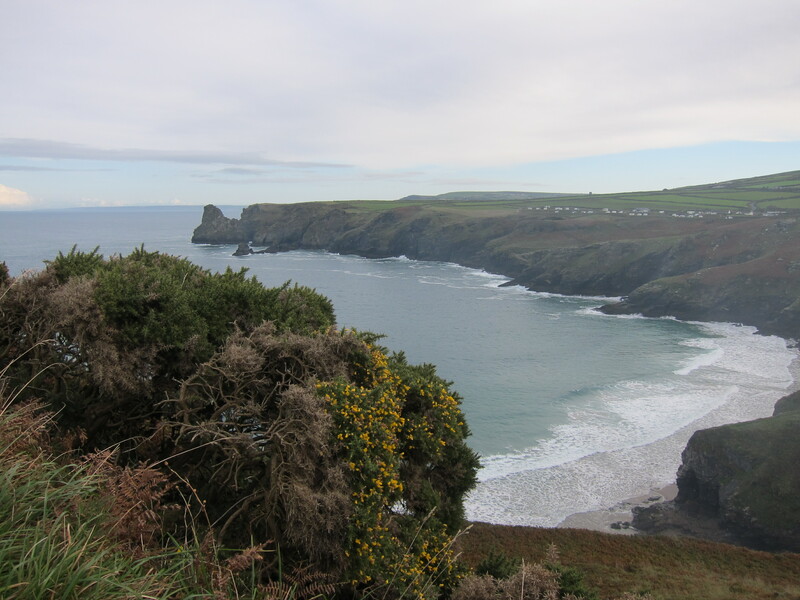 From the top we could see back to Tintagel Head. The massive Camelot Castle hotel is a very handy landmark. 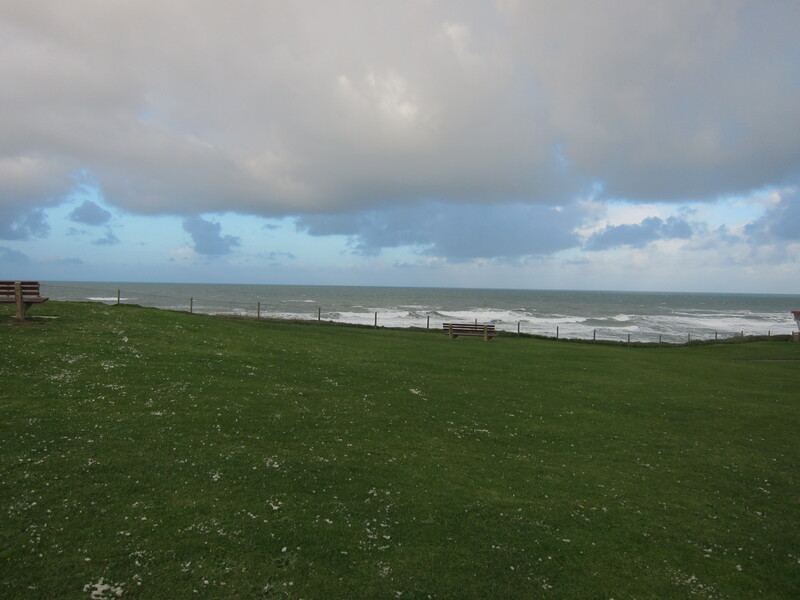 From the first headland we could also see ahead as far as beyond today’s stop at Bude. 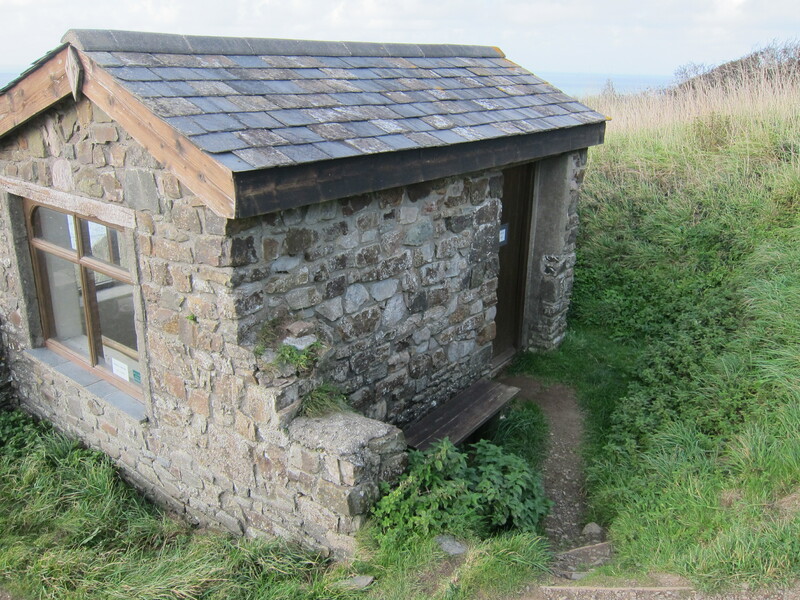 There were another two big drops and ascents, but the countryside is becoming more like the south Devon coast – lots of up and down, but not as steep as much of Cornwall. Around 12, we stopped to eat the pasties we had carried all the way from Tintagel. Despite being locally made there, they were distinctly second rate, compared with some I have had. Shortly after, it began to spit. Chris and Jon were quite a way ahead when Rachel suggested we put on our rain gear – but we were too late. Dancing about trying to get myself into my horrible plastic pants, the rain poured down in a flash squall. It persisted, less violently, for about an hour giving some amazing views of clouds and rainbows. We eventually found a café at Widemouth Bay, where I had a rather good scone. The last hour and a half into Bude was uneventful. Bude does not seem very prosperous. We are in a very nice hotel, looking down over the town after an easy 10.7 miles (17.1km). Another bad journey down from Paddington yesterday. This time the trains were delayed for two hours because someone had been hit by a train at West Ealing. With nothing to do but wait we whiled away the time in the pub. Two glasses of wine and a Cornish pasty, later we got on the packed train – along with all the other passengers from delayed trains. Including a dog, named Daisy. The dog was fine but its owner talked to it incessantly. At one point it made a break for freedom, Jon guessed in search of the quiet carriage. It was noticeable how much shorter the journey was than the last one down to Penzance – progress measured in train journey times! We managed to rearrange our lift from Bodmin and got to Tintagel around seven. Sadly too late to go to the headland, although there was a splendid moon. This morning were delayed in setting off because the luggage people hadn’t confirmed the pick-up. We mooched around the village before concluding that we would leave cash with our B & B to send the bags on by taxi, if they weren’t collected. We also collected some pasties for lunch. 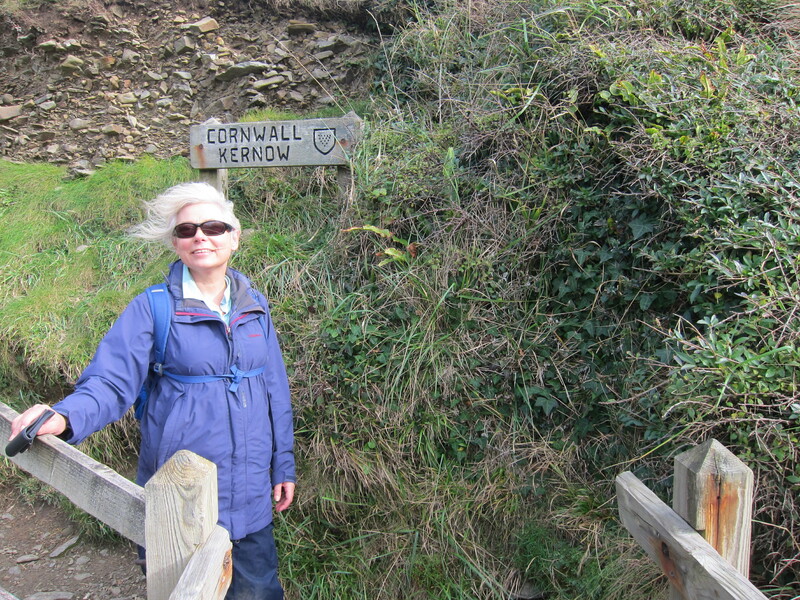 We finally set out around 9.40, down the lane to meet the coast path just to the north east of the village. Today is marked as strenuous in the book. There were lots of ups and downs and, although no single one was as fierce as the days before Tintagel, there were fewer long flat bits. All the way, looking back, we could see the vast Victorian Hotel, the Camelot Castle, out on the headland. It never seemed to get much further away. 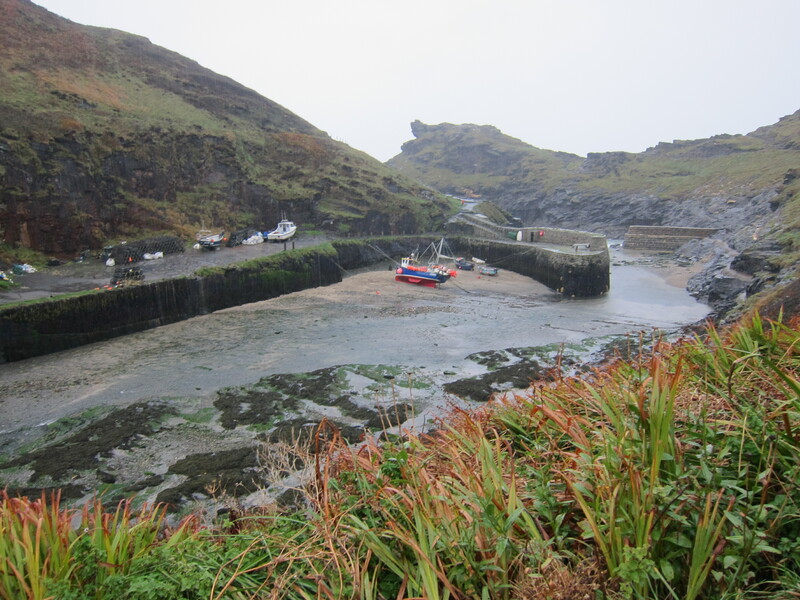 Whilst the weather started sunny, by the time we got to Boscastle – the place almost washed away by floods a few years ago, it was beginning to spit. We stopped in a very nice tea shop for coffee and cake, and as we ate the rain began to come down in stair rods. A vote was held to delay setting out for half an hour to see if it cleared. But it didn’t. So we left around 1.45, suitably plasticked up. It poured for another forty five minutes. Strangely, it is easier to walk on a soaking path, than a damp one. Damp paths are far more slippery than wet ones. 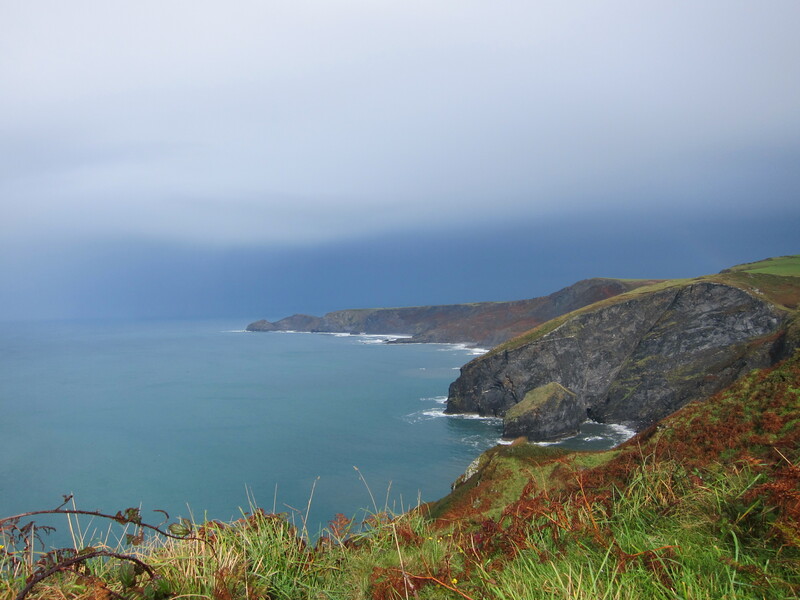 The views were tremendous – the autumn colours looking very dramatic against the grey sky. The rain stopped and the sky turned bright blue, the water turquoise and calm, and the last couple of hours were gorgeous. Now in the pub at Crackington Haven in what would be a nice room if the window were not nailed shut. We had an excellent dinner – I tried some Cornish gin very good indeed! Quite herby. We covered a pleasant 12.5 miles. The moon was full so Rachel and I had a brief walk down to the sea front it was gorgeous in the moonlight apart from a very disconcerting shadow that looked like Quasimodo beating someone with a club. Last night we walked into Padstow from our excellent B&B (called ‘Tamarisk’ and run by Betty – definite recommend). We decided that we: a) would not eat in the most expensive place – meals here are equal or more than London prices, and it can’t be transport or staff as they all claim to serve local produce and wages are low; b) would not eat in one of Rick Stein’s numerous places – not that we object to Mr Stein but after a day’s walking even following a shower and change we don’t really look the part, and c) we would not eat outside. The wind was very sharp and we had spent all day outside. 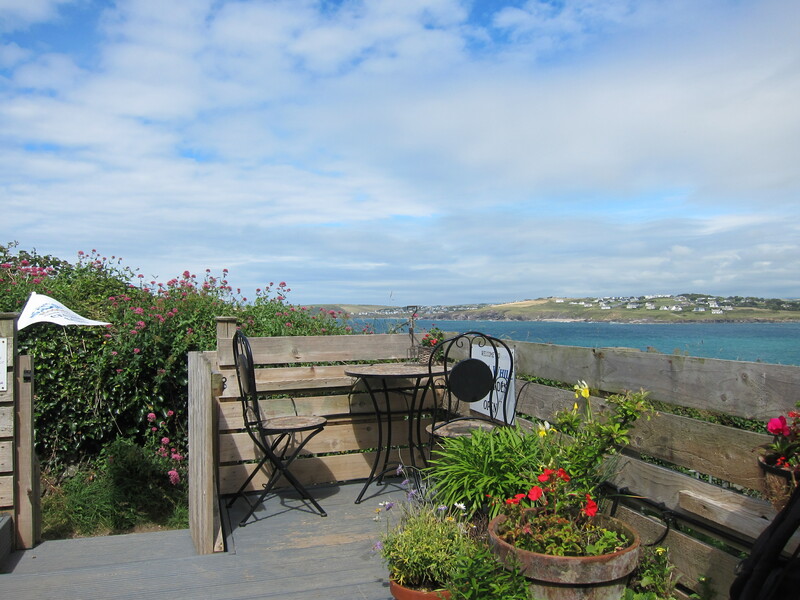 So we went to Rick Stein’s Bistro, ate in the garden and paid a very fine price! But it was an excellent meal. In the morning, we took recommendations from B etty on pasty shops and waited for 20 minutes for a gluten free batch to be finished for Jon. We then hung around Padstow harbour waiting for the ferry across the Camel. 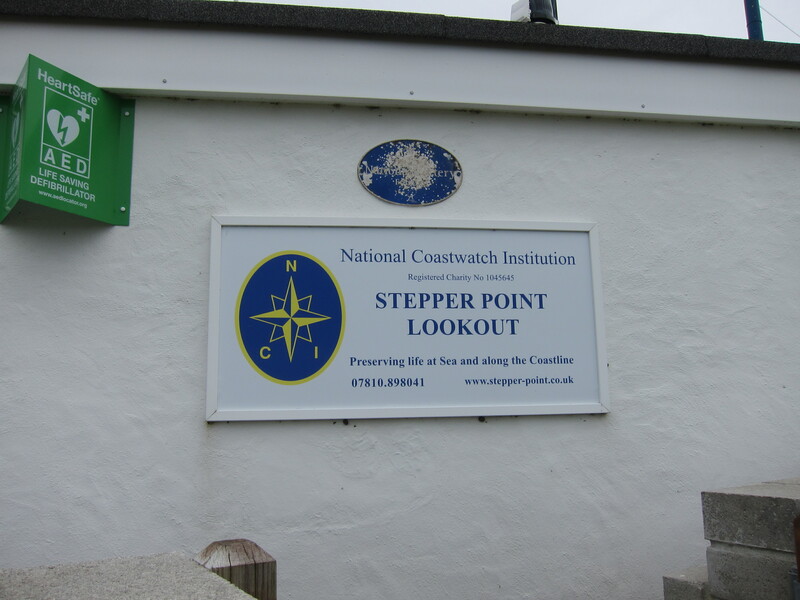 The first section of the walk was easy, from Rock on the east of the estuary to Polzeath where we had coffee. The weather was very fine, quite hot in fact and copious applications of factor 30 were required. Stephen, after feeling rather tired yesterday was full of beans today and in full snipping mode. I can’t remember whether I have mentioned that as an act of selfless public good, Stephen walks with a handy pair of small secateurs and clips over-exuberant brambles from the path. It is a treat to walk in his wake with nothing catching at hair or legs. From Polzeath the route became progressively more difficult, with a number of ups and downs. We reached Pentire Head around 1pm and stopped to eat our pasties, still slightly warm inside mmmm. 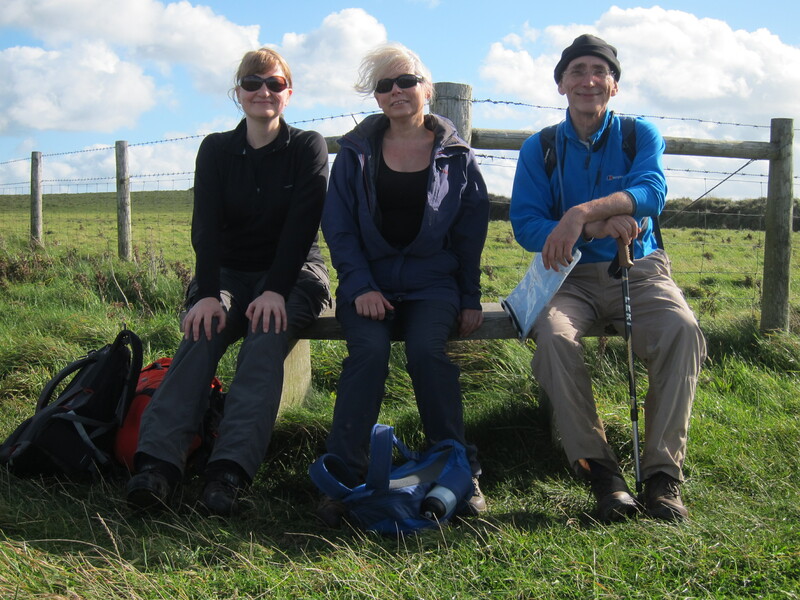 The views were absolutely superb, particularly at the eastern side of the headland. 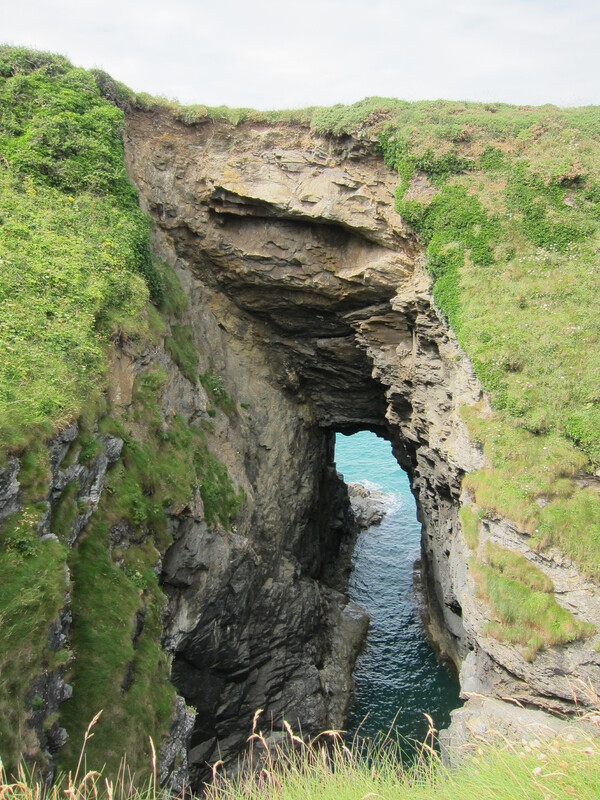 Apparently, it is possible to see Tintagel Head, and possibly even Bude, but it was not clear enough for that. Port Quin a very narrow inlet, also owned by the National Trust, was impossible to see until you were on it. We had promised ourselves ice cream when we reached it, but there was only a tea van with a very grumpy lady in it, who shut up shop promptly at 4pm. 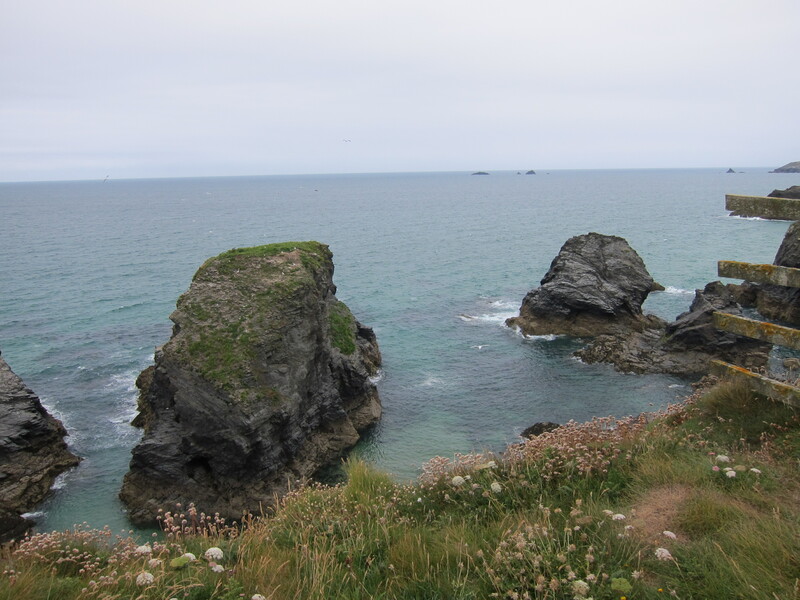 From Port Quin to Port Isaac is somewhat over 3 miles, and a very steep three miles at that. The path drops and rises precipitately, with steps cut into the cliff that look as though they will drop right down into the sea at various points. 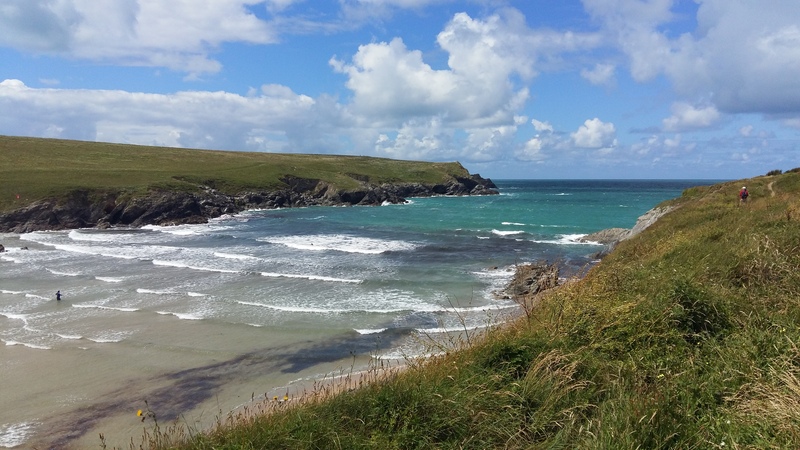 We toiled and moiled slowly along, reaching Port Isaac, which is delightful, except for the stony beach. After being turned away by several restaurants (they claimed they were full, but I fear they thought we would lower the tone), we had an excellent meal in the Golden Lion pub, before ascending yet another hill to our B&B. Today’s distance was 12 miles (20km). Today has been a gentle day, 17.3km (nearly 11 miles) of fairly flat walking, with only one major down and up. We started late after a very convivial breakfast with our host, as the distance was not too great. Yesterday’s sun had completely disappeared and the sky was overcast. The turquoise water had turned to a rather attractive petrol green. A couple of miles brought us to Treyarnon. Unlike yesterday, there were few surfers about, as, despite the chilly wind, there was no surf. 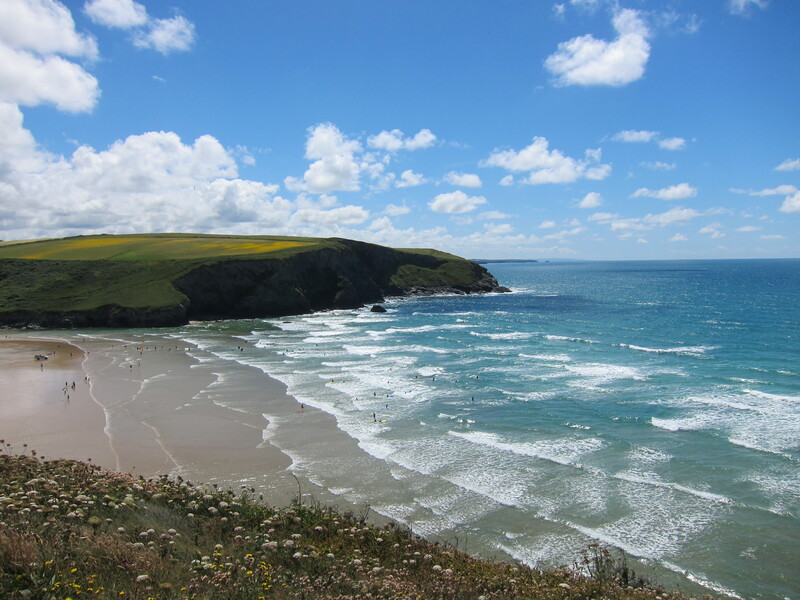 After a coffee in the pub there, we carried on around another couple of coves, and crossed Trevose Head. 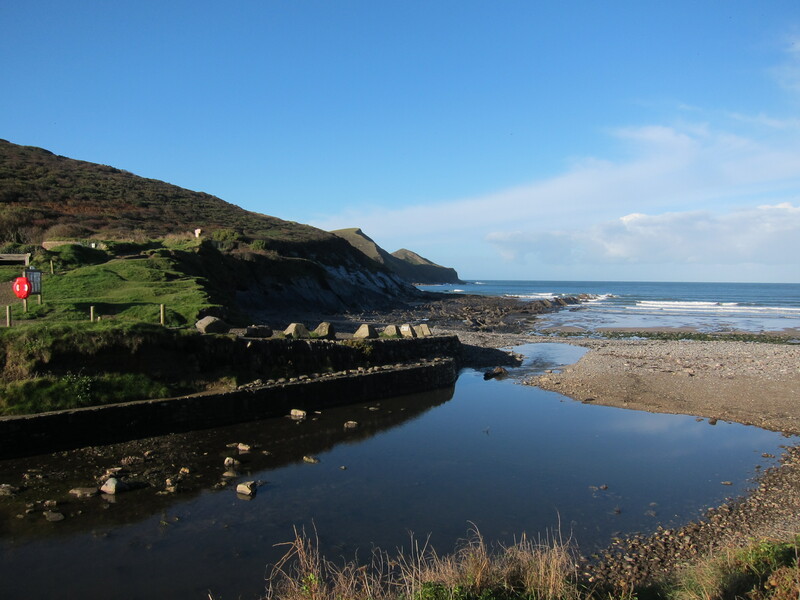 This is yet another area of coast largely owned by the National Trust. From the tip of it, we could just about see back to St Ives. Because of the lie of the land, from this point onward, St Ives will be out of sight. One of the most interesting things in the watch house was a map and list of all the wrecks along the stretch of coast since the early 1600s. It was a fascinating record, ships from Jamaica and Malaysia, Dublin and Falmouth, and even as close as St Ives, many wrecked on Doom Bar, a shifting sand bar across the Camel mouth. Where known, the cargo, the captain and the number of crew lost were noted. The charity is always looking for volunteers, so if you are on the coast, and fancy helping out, make enquiries. After this, we turned down the Camel estuary. The sun had come out and we decided to make for the tea gardens at Prideaux house, a Tudor mansion where the Prideaux family has lived for 14 generations. Before we got there, we were side tracked by another tea spot, the Rest-a-While, overlooking the estuary. So we did, and watched the rather lovely yachts zipping up and down the Camel as we ate a very satisfactory cream tea. It was fortunate we were weak-willed as Prideaux House was closed for filming. We are now in a very comfy B&B in Padstow. Definitely one of the best of the trip. Last night’s B&B was run by a lady who never stopped talking. Not loudly but just an endless wittering punctuated by giggles. We heard all about her allotment, her blackcurrants in particular and her new oven: its price, its provenance, its size, the delivery difficulties etc. Jon and I left Stephen being shown the utensil in detail whilst we popped out to fetch Cornish pasties for lunch and rest our ears. The walk today was glorious. 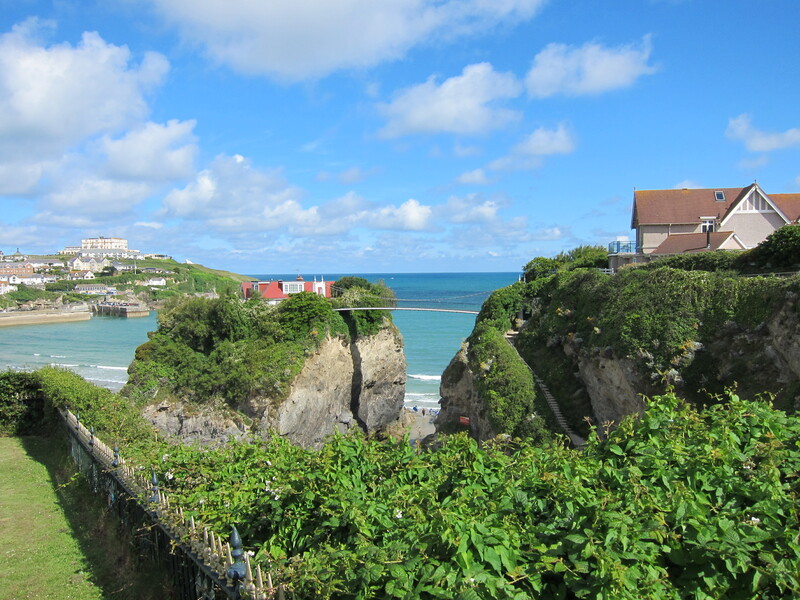 Out of Newquay and over a short headland to a very smart hotel where we had coffee. Like all really good hotels they paid not the slightest attention to our dishevelled state but served us like royalty. Then over miles of headlands, mainly flat with huge views both north and south. The weather was fantastic. Hot sun, but a stiff breeze, the sea turquoise with flecks of brilliant white. We saw so many peregrine falcons we are becoming quite blasé about them. 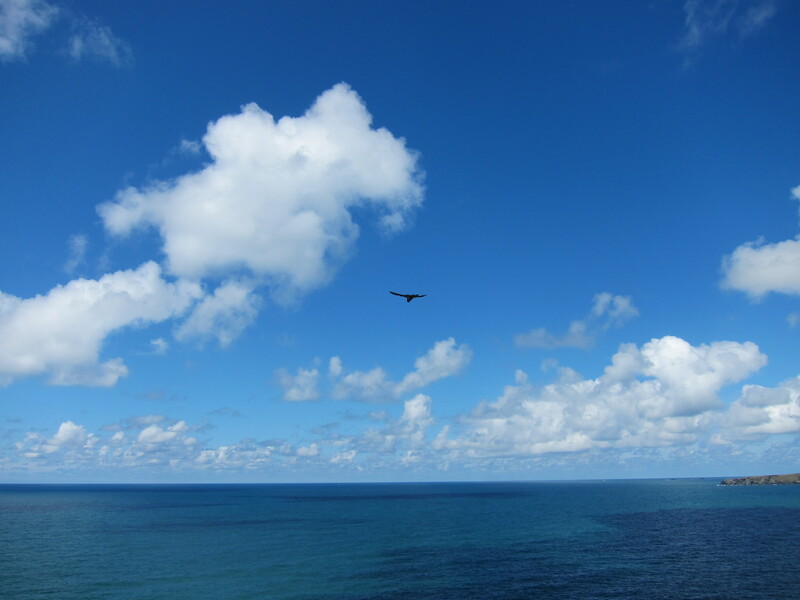 Twice we saw them hovering almost above us and had a wonderful view as they swooped down. We stopped for our pasties – very fine, from Warrens, allegedly the oldest pasty makers in Cornwall. Then we had ice cream at Mawgan-in-Pyndar – honeycomb with strawberries & clotted cream. Yum! We reached Porthcothan around five, and are in a really lovely B&B, set a good mile back from the coast. The village is very small, just a hamlet really, with no shops, other than a beach café, and a pub on the outskirts. We covered a gentle 16.3km (just over 10 miles) on probably one of my top 10 days of the whole walk so far. Last night’s hotel rather grew on me as the maintenance man came to fix the lock on my door. When he isn’t maintaining he is either surfing or firefighting. He definitely brightened my day! The food was pretty good too. I had no luck in Perranporth with finding a new memory card for my camera so I had to do a bit of judicious editing which was absolutely essential as there were certainly some fabulous views to take. The path starts out along the glorious golden sands for nearly a mile (although it was not brilliant weather). Right at the end there were the rather pitiful remains of a whale that beached a few days ago – the pong was pretty fierce, and we were rather boggled at the number of people who seemed to see the poor creature as a tourist attraction. At the end of the beach you climb up onto the dunes. We didn’t go quite far enough and made heavy weather of climbing up the dunes rather than going up the nice wide stoney track. The path then skirts along the headlands, dotted with a few Shetland ponies. The wind was fierce, although other than a shower just when we were starting out, the day has been mainly sunny. This morning was cold though. I don’t know what the wind chill factor was, but it felt no more than on 12 or 13 degrees. Not good for mid-July. Rounding the headland, you come to the little cove of Holywell. At the head of the beach is a pub, where we stopped for coffee and cake, then a stiff climb over dunes. Always hard going and at one point I thought I had pulled a calf muscle but all seems well now. Above the dunes we saw a kestrel, and heard what we thought were its chicks. Back out to a headland, and round a second, past what looked like an army training camp, before turning into another narrow bay, with good surf. We saw another kestrel dive bombing a crow. The crow seemed unconcerned, just ducking as the orangey – brown bird of prey shot over its head, circled and came in again. We assumed the crow was too close to the kestrel’s nest, but we didn’t see any chicks. The next bay is the Gannel estuary. The sun had come out and it was full of children and dogs enjoying the waves. 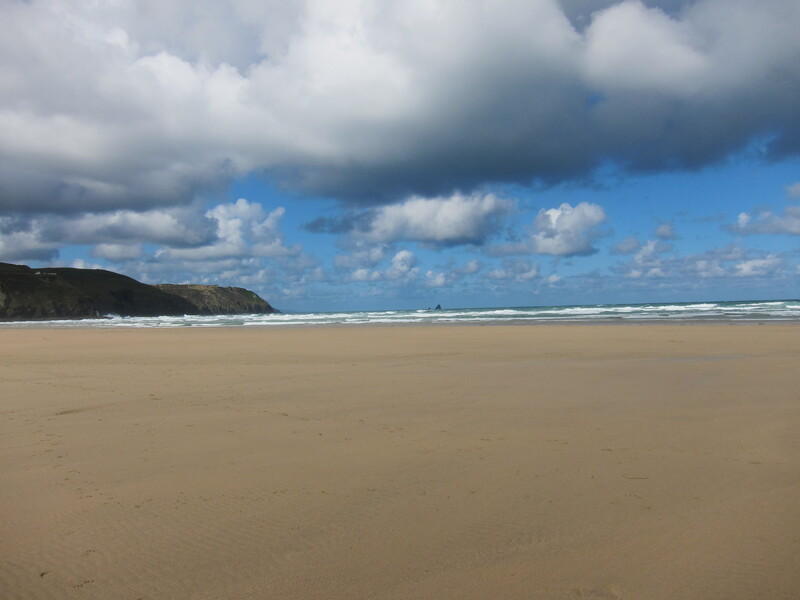 I took my boots off to walk over the Crantock Bay sands which are very fine. Unfortunately, at some point, I managed to lose yet another water bottle. Very annoying. 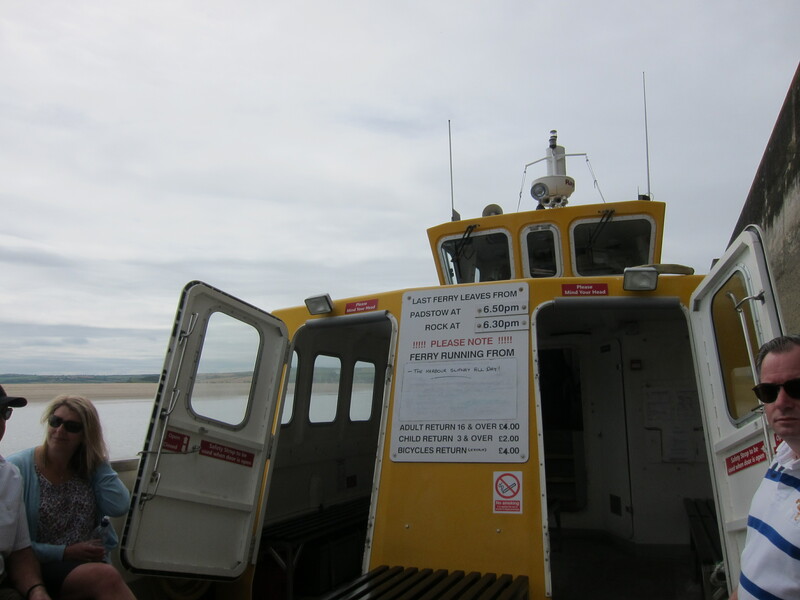 It is only possible to cross the long inlet by ferry or going quite far inland to cross a footbridge. We were in time for the little ferry, which cost us the astonishing sum of 60 pence each as we only needed to take it halfway. 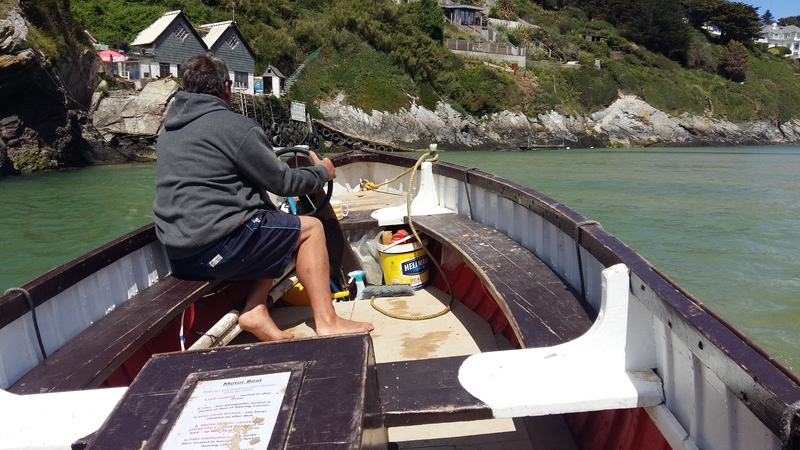 With the tide low, the ferryman came to a little platform half-way across. On the far side, there was a little shop with live lobsters and crabs, waiting to be chosen and sent on their way to the local dinner tables. The hotel at the top gave us our first cream tea of the trip. 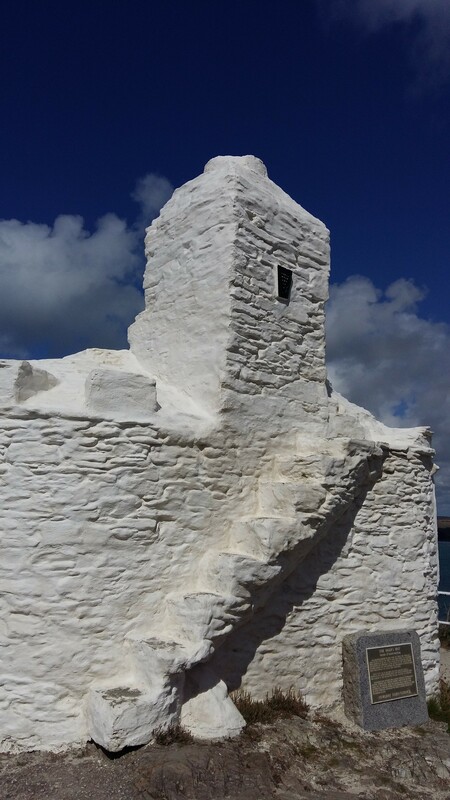 Around another headland, on top of which there was a mediaeval huer platform (where someone was posted to watch for the pilchard shoals) and then along the path above the beach at Fistral, past Rick Stein’s fish restaurant. Don’t think we’ll be eating there!